Another Fab Friday is here. This one is for all my sewing friends. I love myself a free tutorial online. This week, though, I caved and bought some patterns from a site (my fab find) called I Think Sew. The patterns there are very cute, very cheap and come in PDF format immediately after you purchase. 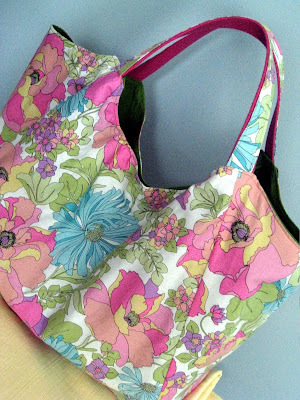 There are also free tutorials and patterns that you can get once you become a member (for free). I received a girls apron, girls tiered skirt, girls pants, kiddie zipper pouch and small clutch pattern. I am going to use it as a beach bag this summer but I used it today because it was dreary out and I needed some fun colors. 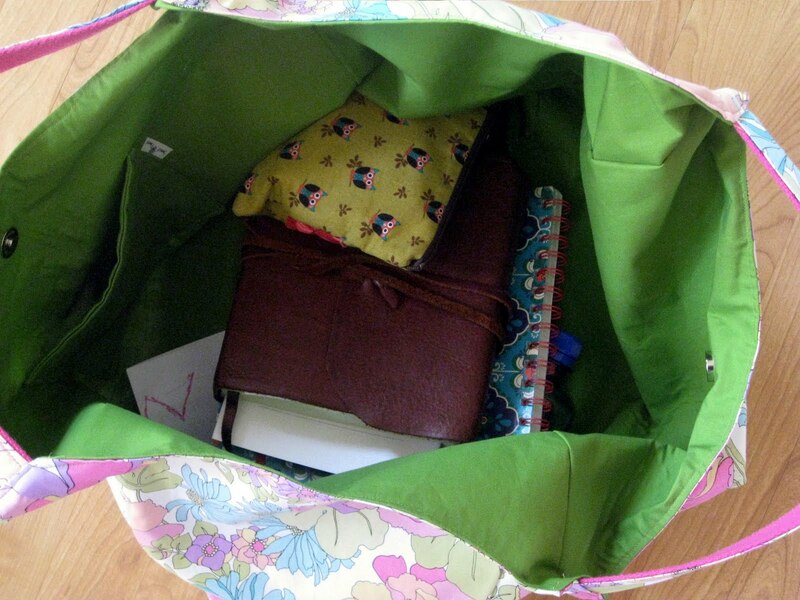 I put in a diaper pack, Bible, wallet, water bottle, notebook, makeup pouch and it didn't even make a dent! All my stuff with plenty of room to spare. My son could probably fit in there! Opens wide! Looks like a shark's jaws. Look out! 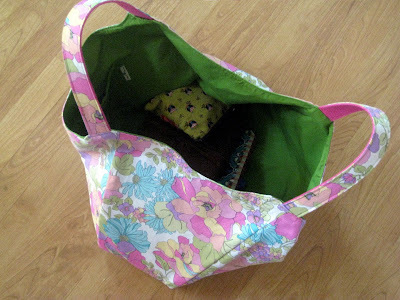 I just love the fabric you chose for your bag! alright tina beans. time for me to comment. i barely know you...we were in a bible study together at HBC back in the day (meaning 5-7 years ago?) just want you to know i love your little bloggie and i read it everyday at work. you are a Little Miss Crafty McButterpants and i love the projects you post. you are funny and fun to follow (or is it stalk because i barely know you?) whatevs. keep bloggin sister. you are great at it. Totally cute! Could I do this???? I have a project I need help with: a bed skirt that needs velcro attached so I can put in on the girls' bunk bed that has slats. Are you interested???? Amy! Of course I remember you. Has it really been that long? Sheesh. Thanks for following ;) So happy that you commented. Beth, I can help you with that!